After centuries of Danish, Swedish, German, and Russian rule, Estonia attained independence in 1918. Forcibly incorporated into the USSR in 1940 - an action never recognized by the US - it regained its freedom in 1991, with the collapse of the Soviet Union. Since the last Russian troops left in 1994, Estonia has been free to promote economic and political ties with Western Europe. It joined both NATO and the EU in the spring of 2004. Technical specifications of the most frequently encountered Estonian gold coins. 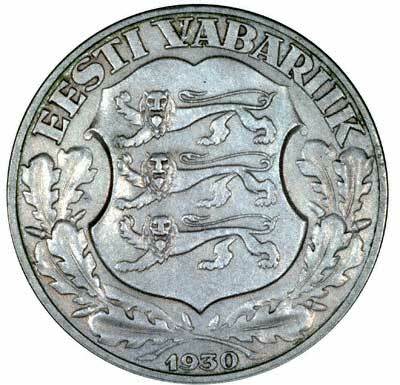 For silver and base metal coins of Estonia, please look at our original Chard Coins website. We make an active market in almost all world coins, gold or otherwise, including Estonian gold coins. If you have any of these coins to sell, please contact us, or post them to us for appraisal and offer.